Join our creative and caring farm-to-table restaurant crew! Comprised of staff and volunteers, together we ensure homeless youth consume hot, healthy meals, while cultivating a safe, welcoming environment. 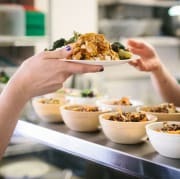 Outside In's fully customized and carefully curated menu caters to clients in need of nutrient-dense meals, seamlessly accommodates various dietary restrictions, and consciously utilizes local, fresh, seasonal ingredients - astoundingly producing over 30,000 meals per year! Come be a part of our unique culinary community! Whether you are a competent chef or occasional cook, all skill levels are welcome! Show our clients you care by spending a couple hours a week connecting with them and nourishing them with delicious food. Outside In supports homeless youth and other marginalized people as they move towards improved health and self-sufficiency. Please go to www.outsidein.org to complete a volunteer application and learn more.